Ramadan is the ninth month of the Islamic Lunar Calendar. Every day during this month, Muslims all over the world traditionally fast daily from sunrise till sunset. Fasting is not just related to food here. They abstain from drink and other physical needs during the daylight hours. They also refrain from evil actions, thoughts and words. Recitation of their holy book, Quran is also an important practice during Ramadan. Its that holy month when the Muslims make peace with those who have wronged them, strengthen ties with family and friends, do away with bad habits – essentially to clean up their lives, thoughts and feelings. As a time to purify the soul, refocus attention on God, and practice self-sacrifice, Ramadan is much more than just not eating and drinking. The fast concludes with Eid-ul-Fitr, the day of rejoice and celebrations all over the world. The clock strikes 6 in the evening and the Muslim brethren are out to recite their mass prayers, the Namaz. 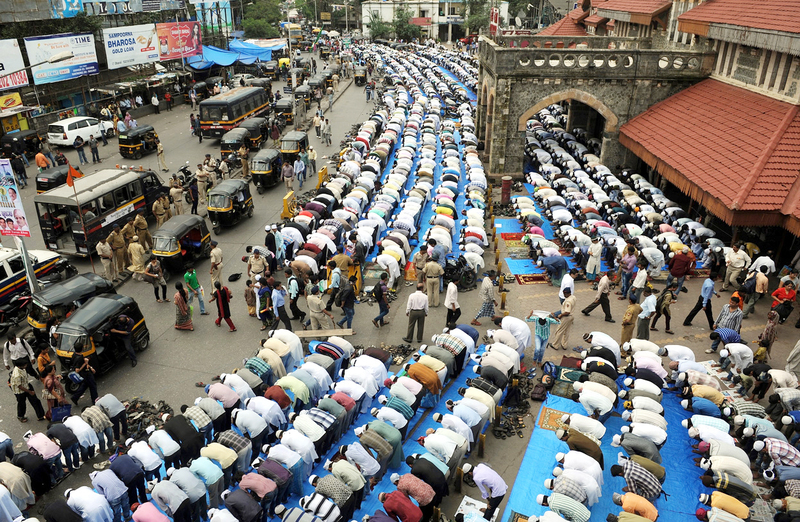 During Ramadan, I always get to see this sight outside Bandra (West) railway station. After Namaz, its time to break the fast which is called Iftar. Dates are usually the first food to break the fast. In Mumbai, this is a fantastic opportunity to gorge on the tastiest food dished out in the so-very-famous streets of South Mumbai. 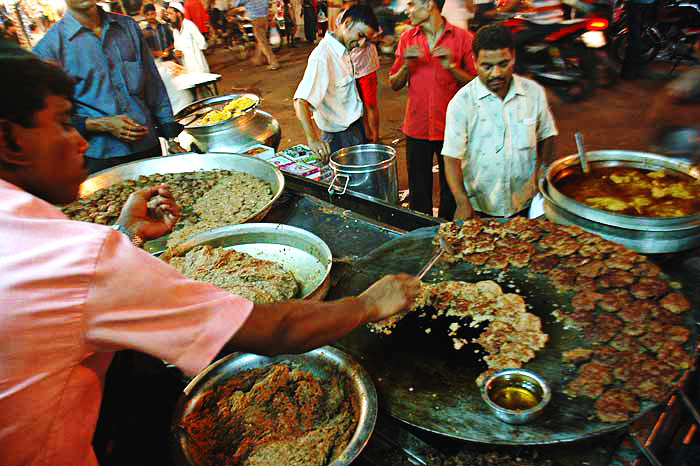 In the evenings, the streets around Mohammed Ali Road in south Mumbai are flooded with people and the tantalizing aroma of the freshly roasted meat. It’s not for the faint hearted though, as the road gets very crowded. Surroundings are replete with shops and stalls selling a variety of items – clothes, jewellery, make up accessories, shoes, toys, books, etc. But what draws the whole of the city to this place is of course, the food. Mohammed Ali Jouhar was a leader of the Khilafat movement and also a co-founder of the Jamia Millia Islamia university. Dedicated to him, this road stretches from Crawford Market and goes right upto JJ Hospital and is lit up during these 30 days. The kebabs are a highlight here. 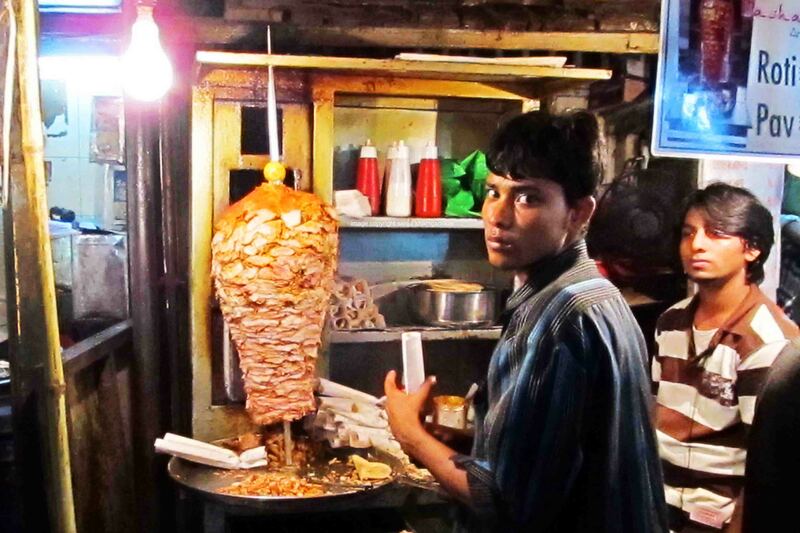 Beef kebabs cost 20 rupees, and chicken kebabs are 60 rupees. If you’re not a real adventurous eater, be careful to avoid the more exotic body parts. 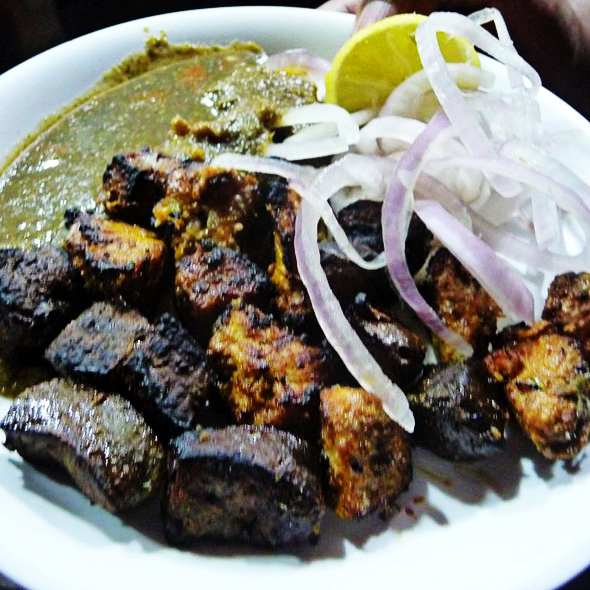 Khiri and Kaleji are a popular delicacy. It’s cow’s udder, seasoned, cooked, and chopped up into little bite-sized pieces. 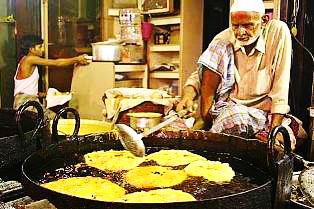 Situated in densely populated area of Minara Masjid at Mohammed Ali Road, the Khau Galli comes to life as soon as dusk sets in as the faithful break their day-long fast. If you are a hard-core foodie with non-veg taste buds, you definately can’t afford to give this place a miss. This lane also boasts of few Bollywood celebrities, sending their regular diet routine for a toss and relishing the food. Not just the Muslims, but a large number of non-Muslims are also faithful visitors of this street. 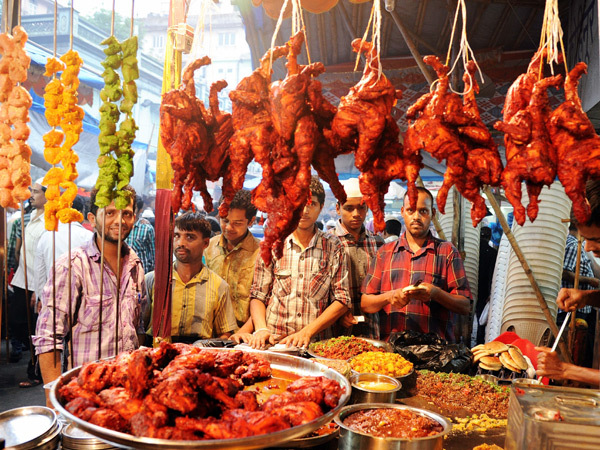 The moment you step in, food-stall owners on either side of the lane start dragging you towards their stalls that offer Meat Kebabs, Chicken Tikka, Khichda, Liver, Kidney, Brain Fry and lots more. 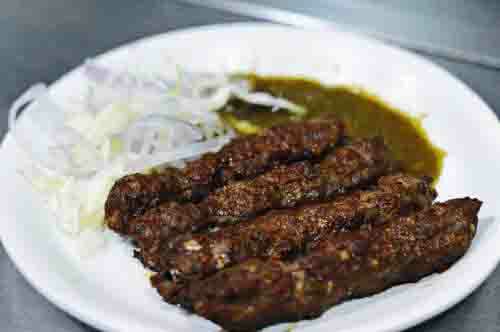 My favourite – the smoking hot seekh kebab served with coriander and chilly chutney, a squeeze of lime and onion. Yummm!!! 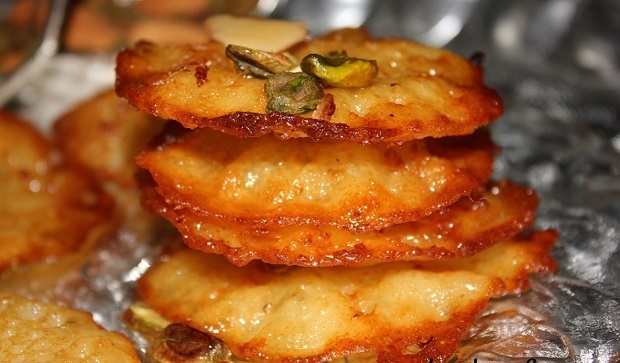 In desserts, I love the Malpua – the sinful, fried, delicious egg-filled, syrup-doused delicacy. 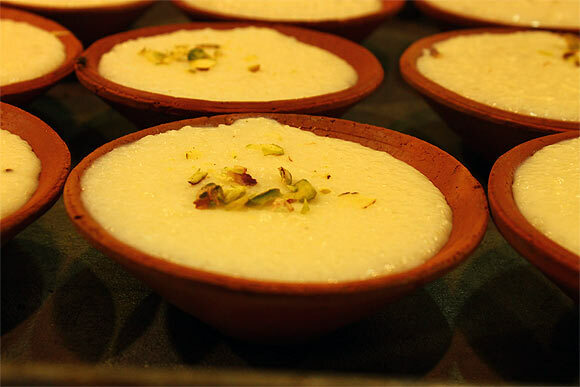 The Phirni is served in an earthen pot which adds its earthy, muddy flavour to the milky delight. I absolutely love it. I always ensure I parcel a couple of more phirnis to relish them at home. There’s also a famous stall that serves Shwarma, a Turkish delight served like a sandwich or in wraps. 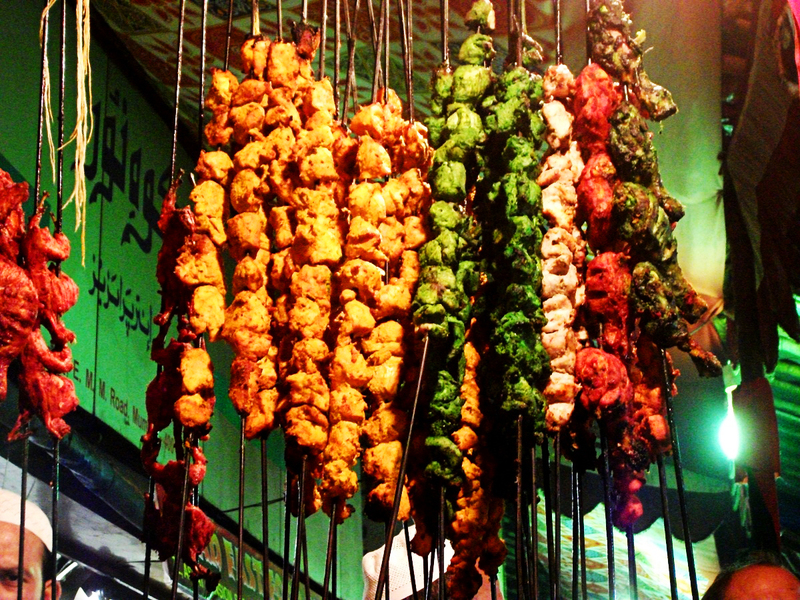 Lamb, chicken, turkey, beef or mixed meat are hung on a rod like thing, grilled for a day and it’s ready to eat. Shavings are cut off the block of meat for serving, and the remainder of the block of meat is kept heated on the rotating rod. We got our Shwarma Wrap for Rs. 40. Its a delight to see the food being cooked right in front of your eyes. 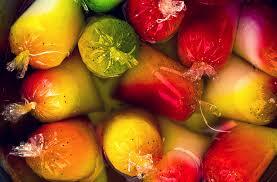 This sight and the aromas are enough to get your brain into action and tantalize your taste-buds. There are a lot of juice and falooda stalls scattered around. 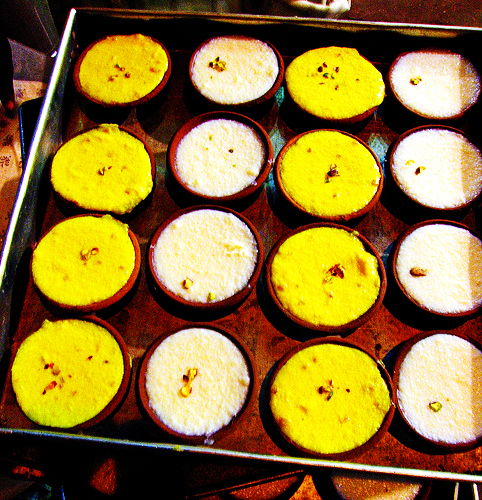 The faloodas are also parceled to be taken home. They are colourful and are bound to attract your attention. This place is amazing and the food is absolutely pocket-friendly. You can hog as if there is no tomorrow and undoubtedly add inches to your waistline. Still have some space left in your tummy for the regal, yummilicious yet humble Biryani? Bade Miya is the place to be. 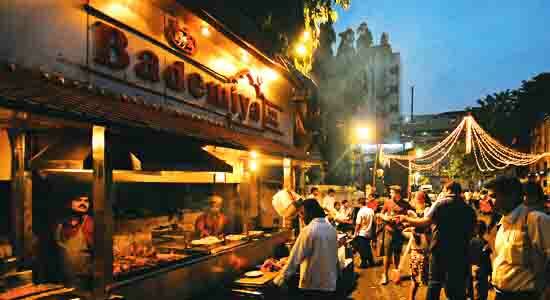 There is hardly any Mumbaikar who hasn’t heard of Bade Miya. It is situated right behind the iconic Taj Mahal Hotel near Gateway of India. We had the boneless Chicken Biryani, Butter Chicken and Roomali Rotis. They are high on price and the servings are way too little to fill you up. 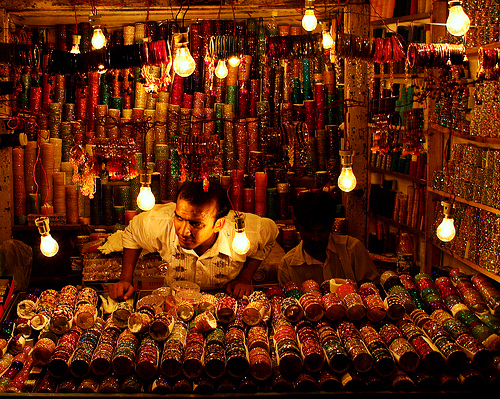 Ramadan gives me a reason to visit Mohammed Ali Road which otherwise never finds a place in my itinerary. Its a festival which makes us break all the religious barriers and be one. And the reason for this reunion is nothing else, but food! Happy Ramadan and keep eating!